Where is the good news in being called a brood of vipers? Or being told that your background or heritage will not make any difference at all on judgement day, and that even now, judgment is beginning to unfold. Or that any tree that doesn’t bear good fruit is going to be cut down and then thrown into the fire? Or that the One to come will burn the chaff not just with fire, but with unquenchable fire! John the Baptist was a straight talker who did not mince words or try to soften his message for the crowds that had come out to the wilderness. So why were the people filled with expectation, and wondering if John might be the Messiah for whom they were waiting? Because John wasn’t afraid to name the truth—that we all mess up. After all, the people gathered around John had to already know that they had messed up, because Luke tells us that they had come out to be baptized by John, who was proclaiming a baptism for the repentance of sins. If these people didn’t think of themselves as repentant sinners, they certainly would not have sought baptism for the forgiveness of their sins. So here’s John’s good news for broods of vipers, then and now. First, John warns everyone that the day of judgement is at hand. “Even now, the ax is lying at the root of the trees….,” a common shorthand of the time for God’s imminent judgement—Jesus also uses this metaphor for God’s judgement. This warning is good news because it states a truth that we need to heed. Our choices can kill us—sometimes quickly, or sometimes in a slow and agonizing process if we ignore the warnings right in front of our faces. Repentance, or turning around when we are warned, is an excellent idea, and John reminds us to do that. If you were driving down a road, you’d want to see a sign that told you that the road was suddenly going to end at the edge of a cliff so that you could turn around in time, rather than to receive no warning at all, and go plummeting to your death at 80 miles an hour. So thank God for warnings! And thank God for those modern day prophets in our lives with enough honesty to warn us that we need to amend our ways and turn away from the things in our lives that lead to destruction, just as John the Baptist warned the people who had come to him seeking baptism for the repentance of their sins. The second part of John’s good news is that we don’t have to wait for God’s judgement with passive fear and dread. When the people asked John what they should do, John gave them the big picture and then specific answers about how they should live as they waited for the judgement to come. John told everyone to share what they had with those in need. He told the tax collectors not to be greedy and to take only what they were supposed to receive. And he told the soldiers, who were poorly paid, not to use their power to extort money from others and to be satisfied with what they had. The good news about what John told the people is that loving our neighbors as ourselves is doable, and that God will help us love our neighbors in ways we never could have imagined, if we ask for God’s help and direction—which God is glad to provide. The last part of John’s good news is this—that the Messiah, for whom the people have waited so long, is coming, and this Messiah is even more challenging and powerful than John the Baptist is. This Messiah who is to come will baptize with the Holy Spirit and with fire. The people who are waiting and longing for the Messiah will receive the Holy Spirit and be set on fire for God and become witnesses to God’s refining and redeeming love to the ends of the earth. 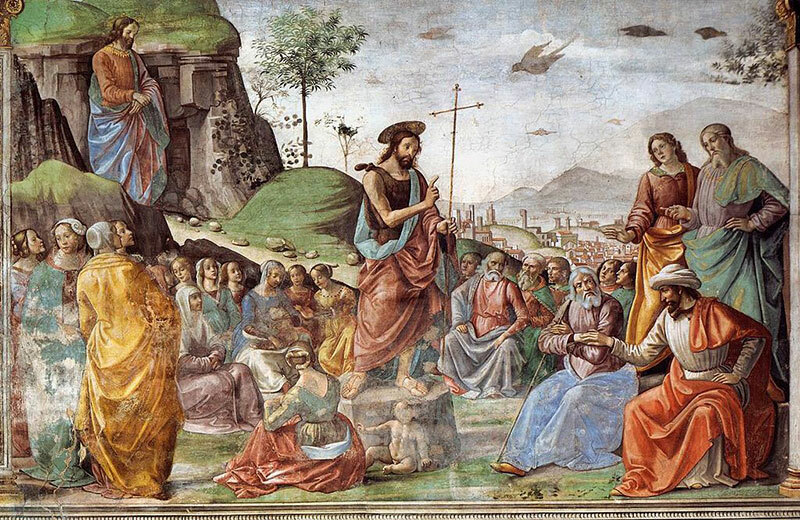 Luke tells us that the disciples received the Holy Spirit and fire, in the form of tongues of flame, on the Day of Pentecost and were therefore able to do infinitely more than they could have ever asked or imagined as they witnessed to God’s powerful and redeeming love. We are the current disciples of the Messiah, and through Jesus, God has also filled us with the Holy Spirit and set us on fire with God’s love. Today is known as Stir Up Sunday because the Collect begins with these words. Stir up your power, O Lord. because God uses God’s power on our behalf, not against us. Only God’s power can deliver us from the things of this life that hold us captive. Only God’s power can deliver us from worry. Only God’s power can give us that deep peace for which we all long. And God’s power is already ours. So with Paul and the Philippians we can rejoice as we wait and pray for God to stir up God’s power on the last day, and with great might to come among us, bringing to fiery completion God’s consuming grace, unlimited mercy and everlasting love. And we can rejoice and give thanks that when we mess up, God will warn us, give us our corrective marching orders and go with us every step of the way. And we can rejoice and give thanks that even as we wait for God’s coming in glory to judge us, we know that already God is in our midst, that God has taken away the judgements against us, and that we have nothing to fear, because we have already been redeemed and restored, through our Lord and Savior, Jesus Christ.